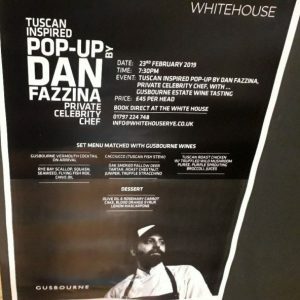 The Whitehouse at 24 High Street is hosting an exciting variety of special food events this spring in its pop-up restaurant programme. 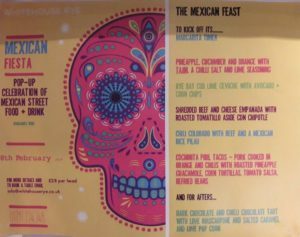 There’s a Mexican Fiesta, pictured right, today (Friday February 8), an American Smokehouse Street Food Feast on Saturday February 16, and a fascinating menu from chef Dan Fazzina on February 23, pictured below. The Whitehouse is not only a contemporary cafe with lovely cakes but boasts an in-house bakery as well as being a pop-up restaurant. It also provides celebration and wedding cakes. As a hotel it has six bespoke bedrooms and operates as a wedding venue. The last pop-up event was the Moroccan Fest which was very successful with 51 people enjoying the occasion. More exciting guest-chef events are coming up, including Spring Fest to celebrate the equinox (March 23) and a Japanese night (April 5). Image Credits: Heidi Foster, Heidi Foster, taken from poster.